When the White Stripes issued a statement on Feb. 2, 2011, that the band had officially ended, it was a surprise. And yet, it wasn't a surprise. The band hadn't released an album (save for a live album) in four years and Jack White was busy working with bands like the Raconteurs and Dead Weather. In the last two years, he has become even busier. White and Third Man Records are behind a lot of great music. 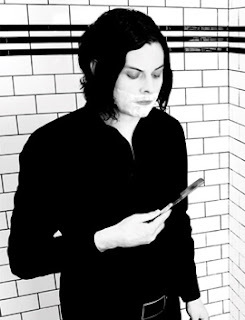 But reading the words that marked the end the White Stripes was still disruptive, even if the intent was pure. Musicians need to evolve and sometimes that means protecting what they made. Nonetheless, while the banner of the American rock band from Detroit (1997) has retired, it's great to see White remerging as a solo artist. It will likely bring a new infusion of life into alternative folk rock, given his DIY style of music. Bands won't sound like White. He will. Love Interruption brings White into focus, rawly inventive and always unexpected. Kicking off the anticipated album Blunderbuss due out toward the end of April is the release of the first single. Love Interruption is a short minimalistic duet, with all the smoke that has become associated with almost anything he touches. Joining White on the duet is Nashville singer Ruby Amanfu. Amanfu, who has had a long run as a singer/songwriter since the third grade, is best known for her duets with Sam Brooker. Coincidentally (or not) Twenty Ten Music put out a 4-track solo session EP by Amanfu the day before the White single. She is solid as a soloist and renowned for her duets, but it's her songwriting skills that are easily among the best in the business (the fourth track, especially). With White, she is the perfect match for Love Interruption, bringing a soulfulness that blends and contrasts beautifully with him. He powers up crisp lyrics; she lends a wavering emotive tone that soothes the delivery. They know how to work together. Amanfu has been working with White here and there for more than a year. It was even around this time last year that Amanfu sang backup for rockabilly queen Wanda Jackson on Conan to support the release The Party Ain't Over, which White produced. White also played guitar with the Third Records Band on the show. The appearance is worth mentioning because it hints at the White magic. He remains elusively independent in his vision, which carries along or allows him to be carried along with others. It has always been about the music, not just what can be cut in the studio, but what can happen naturally and spontaneously. Love Interruption lights up his solo career as experimental as anything (or at least as experimental as Fly Farm Blues), and yet has the familiar signature style that impacts everyone around him. You can even hear it in Amanfu. Listen to her alone and then as an integral part of the duet, and you'll find she sounds markedly different. With White, there doesn't seem to be a moment when she tries, making everything sound impossibly effortless. And isn't that White really aims for on every album? Whether on his own or in mixed company, he is one of a handful of players who deconstructs in preparation of whatever might be played. He markets much the same way. While Love Interruption carries a B-side, you won't find it on the digital release. It's being saved for the 7" vinyl that will be available Feb. 7. The non-LP B-side is called Machine Gun Silhouette. Love Interruption By Jack White Strips Away At 8.8 On The Liquid Hip Richter Scale. In case you were wondering, Amanfu won't be the only guest gracing Blunderbuss. Seasick Steve and Chris Thile (mandolinist/singer for Nickel Creek, among others) are reportedly making contributions too. They have their feet in blues and bluegrass respectively. According to White, these have been the first songs he has written from scratch that have nothing to do with anything except his own expression. You can download Love Interruption from iTunes. The single is also available at Amazon. Unrated, The Simple Sessions by Ruby Amanfu is also on iTunes. While very different from the stylings of White, Making A Living is especially collectible.